I finished this book in 24 hours. Ten years ago this would not have been such a feat. Back then I had the flexibility and leisure to spend a whole day reading without coming up for air. But now with my writing schedule, appointments, meetings, 3 kids and their various schedules, spending time with my wonderful husband and making sure my house doesn't look like a tornado hit it, devoting an entire day to reading a book sounds like a fanciful vacation I would love to take, but have no idea when that will actually happen. So, the fact that I did not spend the entire day curled up in an armchair with my nose in a book, but rather found nooks and crannies and re-purposed time to devour this book is what makes it so extraordinary. 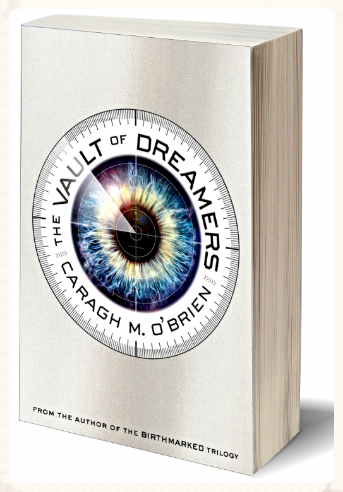 The Vault of Dreamers explores both the high level concept of mining (read stealing) people's dreams from them while they sleeping, while also telling a tale as old as time -- that of two teenagers falling in love. And rather than one story distracting from the other, or the stories awkwardly co-mingling and being apart from one another, they feed into each other. It's really a beautiful thing to watch/read. The other part of this book that made me really happy was the diversity of the characters. O'Brien includes characters of all sorts of ethnic, racial, familial and socio-economic statuses, without it feeling forced. What comes across is a natural reflection of the world we live in-- one that includes all sorts of people. The aspect of the book which I may have found the most fascinating (though I am not entirely sure as there are many amazing details) is the idea of who we are in the public eye, versus our true selves. The main character, Rosie Sinclair, attends an institution called "The Forge School." At this school every waking hours (literally every hour that the students are awake) is filmed. Viewers at home can select their favorite student and follow the student's specific feed to watch them as they go about their day. The number of people that watch a student's feed initially determines whether the student can remain at the school, and later determines how much ad sponsorship they'll receive, which for economically disadvantaged students means a lot. The constant presence of the cameras forces the students to make decisions about what aspects of their life they want the world to be privy to, and creates a situation where the students have to take extraordinary measures to keep some things private. It was a really interesting dynamic and seemed like a commentary on our current world which is engrossed in social media. Is who you are on Facebook who you really are? How much of that is a persona? How much do you post? How do you decide what to post and what not to post? How much do you let people see? The hardest part of reading this book was knowing the next one doesn't come out until February. Usually, I wait until most or all of the books in a series are out before I start reading for precisely this reason, but The Vault of Dreamers was worth it. In the meantime, I may reread O'Brien's previous Birthmarked trilogy, which is another set of books that should make it onto your To-Read list. Stay tuned for the review of the next book on my list Octavia's Brood, and until then, Happy Summer & Happy Reading!